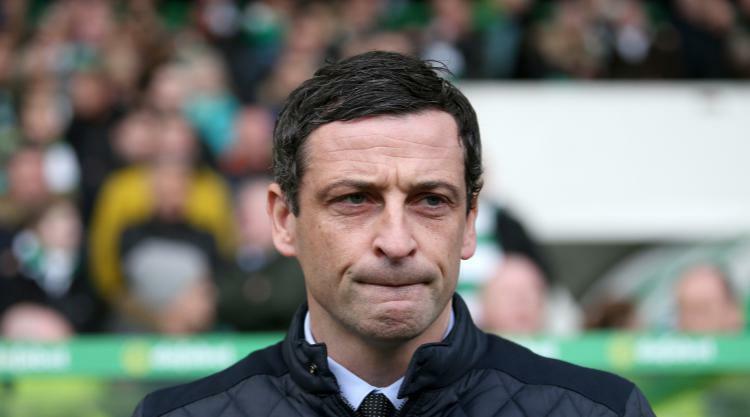 Jack Ross hopes St Mirren's survival joy can sweep the Paisley outfit to promotion to the Ladbrokes Premiership next term. The Buddies looked doomed as recently as February after dropping eight points adrift at the bottom of the Ladbrokes Championship table. But Ross' decision to dispense with virtually an entire team of players and bring in 10 replacements paid off as they grabbed the point they needed to clinch safety on the final day of the season with Saturday's 1-1 draw at Hibernian. His side appeared in trouble after Grant Holt's opener but Rory Loy's equaliser sent the 1,800 Saints supporters who made the journey to Easter Road into delirium. Now the Buddies boss hopes to ride that wave of optimism into next season. He told SaintsTV: "I want to emphasise we're not celebrating finishing seventh in the Championship. As a club we have far grander ambitions than that. "However, given the circumstances and the way the season panned out, where we found ourselves at the turn of the year, it's a fantastic achievement by this group of players and everyone associated with this club, supporters included because they have been absolutely outstanding. "I'm immensely proud of everyone. The players are the guys who go out on the park, the supporters have stayed loyal to us by continuing to turn out in their numbers. "We've shown how strong we can be when that comes together. "It's now about building on this momentum and the feel-good factor around the club and carrying into next season so we can challenge at the right end of the table. "I hope the fans feel we have given them their club back. Until we get it back to where I think the club should be, I won't be satisfied with the job." The hosts were also in party mood as Hibs collected the Championship trophy after the match. Boss Neil Lennon told HibsTV after the draw: "I can't be too critical of them. It's been a long time waiting on the trophy, we've eased off on training a little bit and St Mirren were fighting for their lives. "I'm just really proud of the players and proud of the supporters. It's been a great day." Meanwhile, Morton and Dundee United held a dummy run of Tuesday's play-off quarter-final clash when they met at Cappielow. United could have spared themselves having to play an extra two games had they claimed victory and rivals for second place Falkirk lost at Dumbarton. But they could only claim a point as Kudus Oyenuga headed Morton ahead before Blair Spittal struck from 10 yards to draw the sides level. Nathon Austin struck late for the Bairns away to the Sons to ensure Falkirk finished as runners up to Hibs. But there was misery for Ayr United as they were demoted to League One after losing 2-1 to drop-zone rivals Raith Rovers. Kirkcaldy boss John Hughes had questioned his side's character in the wake of last week's drubbing by St Mirren but they responded impressively after having goalkeeper Pavol Penksa sent-off inside just four minutes, with Jonathan Court and Declan McManus grabbing the goals which hands them a play-off slot at the expense of the Honest Men, who struck through Ross Docherty. In the day's other clash, Nicky Clark's last-gasp winner ensured Dunfermline rounded off their campaign with a 1-0 win at Queen of the South.